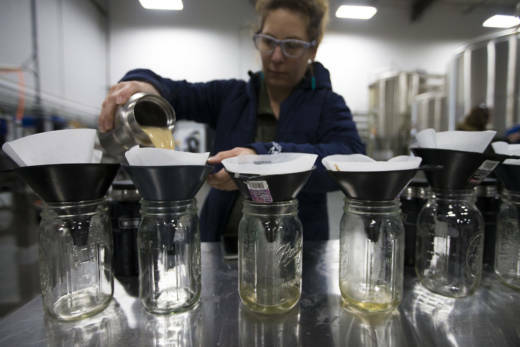 Last week, women around the U.S. collaborated to make batches of beer. Here in Massachusetts, more than 20 breweries signed on to highlight women's increasing influence on what's been a male-dominated industry. But, many women in the field note there are still challenges. Maureen Fabry has been a professional brewer for 20 years and recalled how, early on in her career, she felt like she needed to prove herself. "Not just mentally with the science, but the physical aspect of the job," says Fabry. "You know what that's like, having to pick up a half-barrel keg or 50-pound bag of grain and be on your feet 10 hours a day, seven days a week?" Brewing has long been a boys' club. Fabry never felt excluded because of her gender — and she felt supported by many men — but she did work hard to find female mentors. "Yeah, I mean, I did have that little agenda," she says, laughing, "but I think the more I worked in the brewing industry, the more I noticed that there were other women in sort of supporting roles within brewing, but not so many like on the floor, you know, getting their hands and feet wet." Now, Fabry co-runs CraftRoots, her 1-year-old, 100 percent female-owned brewery in Milford, Mass. That's where this week she brewed a pink-hued, Belgian wheat beer for the collaborative brew day — part of a growing initiative involving women brewers around the world. The event was created by the Pink Boots Society, an international nonprofit that provides scholarships for women who want to move ahead in all different aspects of the brewing industry — from making beer to hops cultivation to quality control and taproom management. "There's actually more women running the brewing industry than people think," says Brienne Allan, head of Boston's Pink Boots Society chapter and production manager at the Notch Brewing Company in Salem, Mass. "A lot of them are brewery owners — and no one knows." Allan says roughly 240 teams of women from 10 countries registered for the Pink Boots Collaboration Brew Day. In the U.S., participants hailed from 46 states. Allan recruited the roughly two dozen Massachusetts breweries that participated in last Thursday's event — up from three last year. Each team developed its own recipe for the group brew. At Notch, for example, 20 women joined Allan in creating a pilsner. Proceeds from the collaborative beers — concocted on International Women's Day — will go back to Pink Boots. The brewery Exhibit "A" in Framingham, Mass., hosted about a half-dozen women who swapped business cards and beer experiences in its big, industrial warehouse surrounded by gleaming, stainless steel fermentation tanks. Kristen Sykes walked around sporting bright pink rubber boots, beer mug earrings and a black T-shirt that read, "Mash the Patriarchy." She heads up the Boston Area Beer Enthusiasts Society (BABES). "There are women who have always been supporting men in the beer industry, but they're kind of behind the scenes because they're not the rock star brewer that everybody does media about — but they're the ones who are basically keeping the lights on," Sykes says. Sykes helped create the label and recipe for Thursday's brew: a hoppy wheat beer made with lemon verbena. Andrea Stanley grew the grains at Valley Malt, her farm and malt house in western Massachusetts. She observed that while women in beer have come a long way, there's still a lot of work to be done throughout the beer ecosystem. "The whole ripple of the industry — you have the people that are working behind the bar that are a lot of times hired because they have a certain body shape, or whatever, you know?" said Stanley. Equality and diversity are also issues for home brewer Lisa Small. "Still very white, male-centric," Small says of the craft beer world. "I mean, you go to any brewery and usually the head brewer is a man, who's usually white." That's the case at Exhibit "A," where the brewery is still predominantly male-run. But head brewer Matthew Steinberg says he started training one of his female employees, Katie Beaucage, after she expressed interest. Now she splits her time between brewery operations and the tap room. For Steinberg, this female-driven brew day is as much about supporting women as it is about making beer. "Yes, the liquid is the thing that's going to bring us all together, especially when the beer is [ready] and we're in this room drinking it all together, hopefully," he says. "I still feel that it's about the conversations that are happening right now, behind us, that speak volumes to what I think the beer industry will be in a few years." There are no stats about the number of females in the nation's booming craft beer industry. "Unfortunately, no one is tracking that data yet," says Katie Stinchon, executive director of the Massachusetts Brewers Guild. The national Brewers Association also said it did not know of any such figures. "I think it's something we're all interested in going forward," she says," because we want to know the power of the industry and how many female-driven breweries we have." Stinchon adds, "There's a lot of female finger prints — if you will — on each beer that's getting out the door, so we're really proud of that." But even with the rise of women throughout the industry's ranks, Brew Day organizer Brienne Allan feels frustrated. In the age of #MeToo, she notes that some breweries have been jumping to market or re-brand products for women — including a beer made with food-grade glitter. "A lot of places think they're helping, and they're not actually realizing that they're just segregating everyone even more," says Allan. Sexism goes down slowly, it seems. Longtime brewer Maureen Fabry recalled a recent patron from Eastern Europe who couldn't believe she's the one-and-only brewer at CraftRoots. "But then he started drinking the beer, and he got over it," she says, laughing. "And if that's how I have to prove that a female can do it — by what's in the glass — that is what makes me the most happy, that is where the battlefield should be." The Pink Boots brew day beers will be ready in three to four weeks; the women who pitched in to make them hope to gather together to share the fruits of each team's labor. Andrea Shea is a senior arts and sometimes agriculture reporter at Boston member station WBUR, which first aired this story. She was a professional brewer back in the '90s and continues to track the industry's evolution.